On July 20, 1969, mankind made what had only years earlier seemed like an impossible leap forward: when Apollo 11 became the first manned mission to land on the moon, and Neil Armstrong the first person to step foot on the lunar surface. While there have only been a handful of new missions since, the fascination with our planet’s satellite continues, and generations of writers and artists have imagined the endless possibilities of lunar life. From adventures in the vast gulf of space between the earth and the moon, to journeys across the light face to the dark side, to the establishment of permanent residences on its surface, science fiction has for decades given readers bold and forward-thinking ideas about our nearest interstellar neighbor and what it might mean to humankind, both now and in our future. 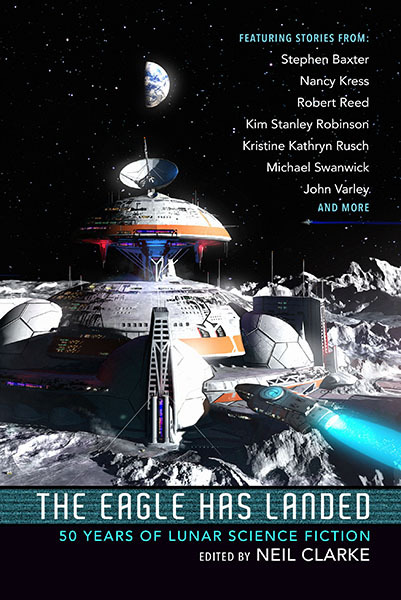 The Eagle Has Landed collects the best stories written in the fifty years since mankind first stepped foot on the lunar surface, serving as a shining reminder that the moon is and always has been our most visible and constant example of all the infinite possibility of the wider universe.